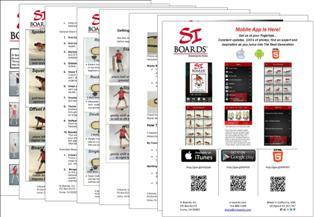 Medium Balance Board combo for Surf Training, SUP and Water Sports. Multi-Direction Stability Training. Dry Land Practice for Pop-Ups and Rotational Power. Paddle out with strength, catch the perfect wave, pop up with precision and carve your way to an awesome session! This combos give you everything to practice pop-ups, longboard footwork, rotational power and balance. Balls sizes allow you full progression from keeping the board level to huge sweeping turns. 5" Small ball is a great start to quick turning, responsive riding and overall balance challenge. Keeping you close to the ground with limited tilting requires your hips to stay level and fine tune your movement. A fun combo with lots of forward and backward motion. With two under the board you can practice pop-ups and walking the plank. 6.5" Medium ball gets you up high and lets you flow into any turn with a lot of tilt and grace. Take it easy and hang out with stability or activate your body and carve hard into the edge. This combo requires strength and coordination. Always challenging with lots of hip movement and reaction. 8.5" Large ball will challenge your strength and skill to control this board. Being up very high with tons of board tilt makes for a very fun carving session. Initially slow to start but once momentum is gain with the weight of this heavy ball, your body will have to kick in extra hard for stability. This combo is great for taller and advanced riders. 8.5" Half Balls create you own rocker board or wobble board. Add upper body control while you stabilize your lower body. Perfect for practicing SUP paddle strength, rotational strength and pop ups. Create your own unique combo with this board. Add the balls and half balls that meet your training needs. Features a steel rail system you can attach Resistance Bands to expand your exercise routine. The Surf Original is so much fun, you'll find yourself wanting to use it every chance you get. I incorporate it into every workout, I frequently use it at the office with my standing work station (as a rocker board with the half balls) and I ride it for fun when I have down time. Top quality products and top quality customer service - thanks, Elysia! Purchased this board online at the recommendation of a friend. Not only is it a blast to use but it's helped to improve my surfing, balance and coordination among other things I probably don't even know about. In addition the staff and owner have incredible customer service. Since I lived near the distribution center I got a call and offered to deliver in person! I love working with comapnies like this! Best of luck to you guys!